For fans of OS X’s Dashboard feature, the Dictionary widget may be the most convenient alternative to launching the application. Just activate Dashboard, choose your data source (Dictionary, Thesaurus, or Apple—there’s no Wikipedia option here) from the source pop-up menu, and enter the term to be defined. (The source menu also lets you see the results from other sources after the search has finished.) Click the letter button to the left to view other words with the same root. Activate the Spotlight search menu (Command-spacebar) and type a word you need defined. The first definition from OS X's Dictionary appears in the menu. 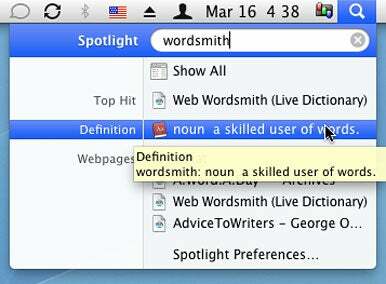 Much to many Mac users' surprise, you can use OS X’s Spotlight feature to quickly look up the meaning of a word—Dictionary definitions are among the myriad types of data Spotlight can search. Just activate the Spotlight search menu (by clicking the Spotlight icon in the menu bar or by pressing Command-spacebar) and type your word. 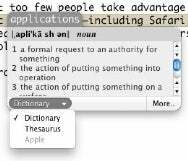 In a fraction of a second, the first definition from OS X’s Dictionary appears in the menu. 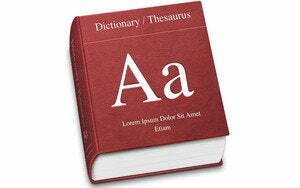 Few definitions will fit on a single line, so hover your cursor over the text to see the full definition, or select the definition to open the Dictionary application to that word. Although you can change, via the Spotlight pane of System Preferences, the order in which most types of Spotlight results appear, Dictionary results are always listed near the top of the menu, just below the Top Hit. “Launcher” utilities such as LaunchBar, Quicksilver, and Butler are popular OS X add-ons, and many of them provide a way to quickly look up a word’s definition in the Dictionary program. For example, as a longtime LaunchBar fan, I use LaunchBar’s this feature several times each day: I just activate LaunchBar, type di (for dictionary), press the spacebar, and then type the word for which I want the definition. LaunchBar launches the Dictionary application directly to the definition of my word. In many Mac programs, you can hover your cursor over a word and press Control-Command-D to see this definition balloon appear. One of my favorite OS X features, and one that too few people take advantage of, is systemwide pop-up definitions. In most recent Mac applications—including Safari, Mail, and most other programs that display text or let you edit text—just position the cursor over the word you want to define and then press Control-Command-D. A floating balloon appears containing the definition(s) of that word. You can switch to the Thesaurus entries for that word using the pop-up menu at the bottom of the balloon, and clicking More will open the Dictionary application and look up the word. A nice touch is that if you hold down Control-Command-D while you move the cursor around the screen, the definition balloon updates continuously to display information about whichever word is beneath the cursor. Sometimes you don’t care about definitions or synonyms; you’re just trying to remember a particular word, or you’re looking for similar words. OS X includes an auto-complete feature that can help. After typing a few characters in a text document, e-mail message, or Web form, press Escape. OS X will display a list of all words that start with those characters. Choose one (by clicking it, or by using the up and down arrow keys and then pressing Return) and it will be inserted immediately. Unfortunately, this trick works in fewer programs than the previous one. For example, while I can look up definitions of words from within Bare Bones Software's BBEdit, the auto-complete feature doesn’t work in that program.